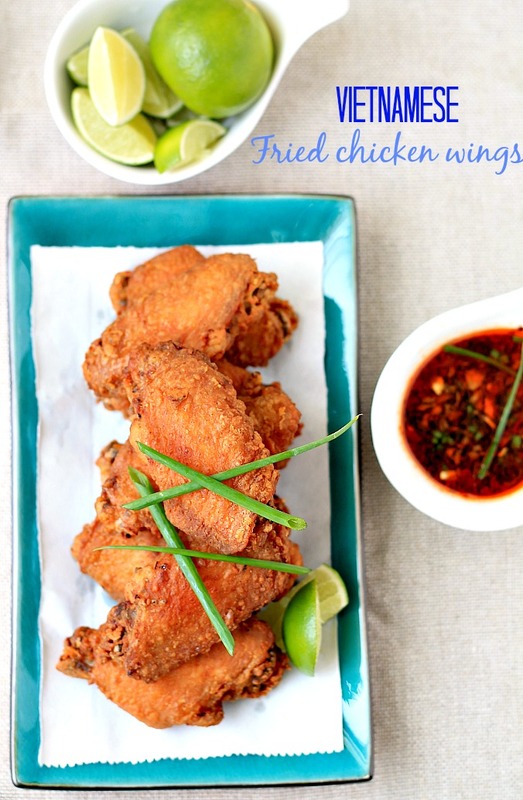 my bare cupboard: Vietnamese fried chicken wings "
As promised , to thyself . Making the Karaage was just a start . I'm thinking of making Japanese , Korean and Thai fried chicken in the near future . Some Vietnamese fried chicken wings that you can find online has some kind of glaze - delicious , sticky glaze but the ones I have here are just plain ol' fried chicken with big flavor ! Even the chicken bones tastes flavorful - I kid you not ! The chicken is crunchy while it's still warm , so better eat it all before it gets cold ! The recipe comes with the ginger sauce for dipping but I've forgotten to print it before I returned the book to the library . Instead I served it with lime and my DIY spicy sauce that consists of soy sauce , lime juice , homemade chili sauce , ginger , garlic and spring onion . * Wash chicken wings in water with a little bit of salt added , rinse and pat dry with kitchen paper/towel . * Combine garlic , onion , pepper , five-spice , lemongrass , fish sauce and raw sugar , add in chicken wings and use hands to mix everything together . Chill in the fridge for at least 30 minutes or better overnight , if you have time . 2 hours before I cooked the wings , I added the lime juice to the chicken mixture . * Just before cooking , shake excess marinade off wings . Mix plain and rice flour together , then one piece at a time , coat wings in flour mixture , shake off excess flour . * Heat oil in a large saucepan over high heat , to test whether the oil is ready , drop a sprig of any green herb and when it sizzles , you can start frying . * Working in batches so as not to crowd the pan , fry wings for 7-8 minutes or until golden brown and cooked through . 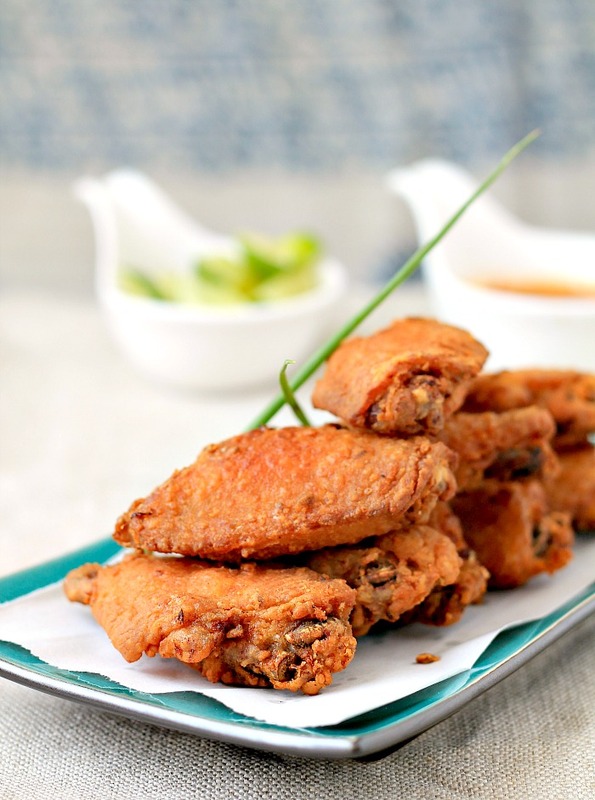 Serve fried chicken wings , hot or warm , with some chili sauce that you prefer . 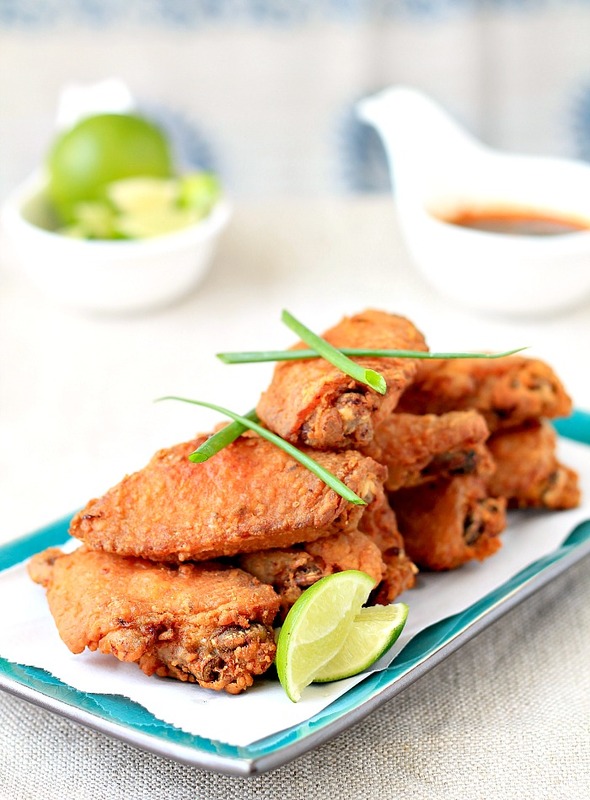 I have been to Vietnam for few times, but never tried their fried chicken before, hehehe..This fried chicken wings sound like the usual lemongrass fried chicken wings I made, but this recipe has fish sauce and five spices powder, I bet it must taste heavenly! Clogged arteries??? But oh what a way to go, Anne!!! As much as I love this recipe Anne, I must confess, I just checked out that book on Amazon and I really really want it!!! I've added it to my someday list:) It sounds great and the reviews are so positive. Thank you! As for those wings of yours, well, they look delicious! I'm sure the ginger sauce would be good with them too but I think you have improvised quite deliciously, lol...Thank you so much for sharing, Anne. I sure wish I had some of those wings right now!!! they look super crispy..! i am not sure about the sticky kind of vietnamese wings but yours look really good..even the bones are flavourful?? i will chew on that, you bet! I haven't either, Anne. The chicken wings look nice and crispy. On my list of things to try soon coz my daughter has been asking me to make fried chicken from long time. Chilli sauce sounds good with it. I can't believe I have never made fried chicken before. What is wrong with me?? This looks fantastic! Here’s a sneak peek into our online polymer clay class! mybarecupboard.com. Theme images by nicolas_. Powered by Blogger.